Realme 2 Pro with 8 GB RAM, Flipkart will be selling: -With the Realme 2 Pro, the curtain will rise in India on September 27. But just before the official launch, information has been revealed that this phone will be equipped with the Octa-Core Qualcomm Snapdragon 660 processor. This was revealed by the listing of Benchmark site Geekbench. This phone will be upgraded to Realme 2, recently launched with the Snapdragon 450 processor. The Geekbench listing also revealed that Realme 2 Pro will have 8 GB RAM. It is worth noting that the most powerful variant of Reality 2 is equipped with 4 GB RAM. Realme 2 Pro with 8 GB RAM, Flipkart will be selling : Oppo RMX1807 codename has been used for Realme 2 Pro in the listing of Geekbench. It is possible that this will soon be codenamed for the handset that launches. The listing points to the Snapdragon 660 processor and 8 GB RAM. Apart from this, there has also been confirmation of the Android 8.1 orio. 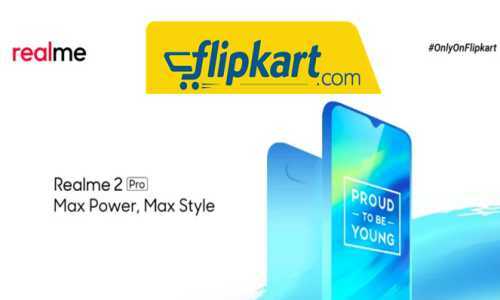 At the same time, Realme's tweets have become clear that Realme 2 Pro will be available exclusively on Flipkart. Be aware that Realme 1 Amazon was an exclusive product. After this, Reality 2 came on exclusively at Flipkart. From the Benchmark site listing, it is also clear that the Reality 2 Pro handset in single core and multi-core test has given very powerful results compared to Realme 2. Both of these phones have been made possible due to different processors. The information about Geekbench listings was first given by 91Mobiles. Prior to this, the teaser video of Realme 2 Pro was released. The title of this teaser video is "Proud to be Young". This video confirms the Waterdrop Design and Vertical Dual Rear Camera Setup in Reality realme 2 Pro. In advertising, video indicates more power and better performance than the recently launched Realme 2. Apart from this mobile, the game chewing experience is promising. Waterdrop has been given in Realme 2 Pro, which we have got in the handset like Oppo A7X and Vivo V11 Pro. The teaser video also offers a glimpse of Reality 2 Pro's matte back variant. Real me 2 pro has a 3.5mm headphone jack, which has a place next to the USB port and loudspeaker grill. This time, new color variants are also expected to be brought Real me 2 pro .